Since the two Strikers titles were among the first ones I bought for my Sega Saturn library, I decided a while ago that I would strive to beat both of them. While the first game did not take too long to be looped, I sort of hit a wall when I finally got to play Strikers 1945 II. The second Strikers game was so much harder than the first one that I gave up after just a few plays! Some weeks later I thought it would be nice to give it another try as it was gathering dust in my top shelf, where the games to be beaten sometimes pile up. This time around I played in the mode known as Original 1 (fixed YOKO orientation). I found out this mode made the game a little bit easier in contrast with the wobbling nature of Original 2, the mode in which I beat Strikers 1945. Every shmup fan who played a Psikyo vert game before knows the deal here. Extremely fast bullet patterns (especially during boss fights) and a fierce ranking system that forces you to rely heavily both on memorization and precise dodging. 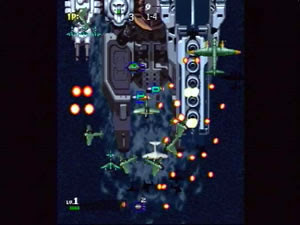 The gameplay in Strikers 1945 II remains almost the same as in its predecessor: one button for firing and charge attack and one button for bombing, with 6 planes to choose from. The difference is in the charge attack, which can de deployed in 3 different power levels according to the energy bar that fills up as you kill enemies. This allows for some intricate play strategies that can make your life easier, especially in later stages. Speaking of these, there are 8 of them, and the first 4 are always shuffled every time you play. If you don't die or bomb, the difficulty gets nasty pretty fast due to rank progression. For the 4 initial stages it's like having to learn 4 different ways to beat each one of them, and I can't help thinking this is a cheap yet somewhat smart move to account for the game's potential lack of replay value. I can't say anything special about the music, but the graphics are nice enough. The Saturn port does have a problem of slowdown in certain areas (something that wasn't an issue at all in the first game), but aside from that it delivers what it's supposed to as a cheap and frantic shmup. You know... The harder the challenge, the sweeter the reward. It always feels good to beat a game like this, and it's even better when at first you think the task is not worth your time or is just beyond your current skills. The sad thing about Psikyo, however, is that I don't feel like playing these games again after the 1CC is scored (with the exception of the excellent Zero Gunner 2). 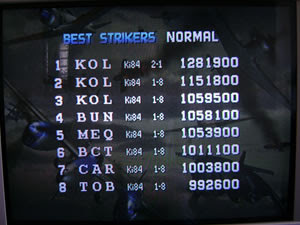 You see, right after I 1CCed Strikers II and took a picture of my high score I shoved it back into its place inside the shelf. And I have no intention to dig it out any time soon. Strikers 1945 II belongs to the category of shooters that are perfect for a 15 minute ride. Casual players will definitely shy from it, but difficulty driven shmuppers should try it at least once to see how it ranks in the myriad of games that are not so retro but still cannot be inserted into the bullet hell subgenre. 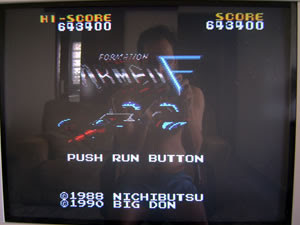 Psikyo-wise it’s probably the hardest game I’ve beaten so far (ahead of Gunbird, Zero Gunner 2 and Strikers 1945). Some words of advice if you decide to face this challenge: in my opinion the best plane is the Hayate Ki84, it's got the best charge attack by far; learn how to anticipate enemies and crush them with Hayate's charge attack as they enter the screen; if you have to stick with YOKO, avoid the Original 2 mode. This is an arcade port that seems to be fairly decent by what I can see in the pictures from the arcade game, given the capabilities of the PC Engine hardware. 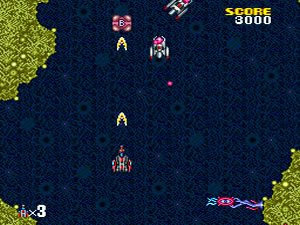 It reminds me of Salamander and - to a lesser extent - Truxton, with a huge difference everybody will notice right from the start: colors, colors, a multitude of colors fill the screen to the point it gets annoying to distinguish bullets from backgrounds. This also poses another challenge when you have walls to deal with. In a setting of organic fields mixed with some sci-fi scenarios, I consider the gameplay mildly enjoyable. You have a big hitbox but, on the other hand, collision detection is very well implemented, so you don't have unfair deaths during the various claustrophobic parts of the game. You'll always know why you died, unless you're in that 4th pink stage with pink bullets that seem to come out of nowhere sometimes (no, I'm kidding, but again this is where the color mixing problem has its peak in the game). Memorization is sort of essential here if you want to perform well, but not to the point where you'll spend days going through the stages to nail them. The trick is adapting your weapon selection skills to the environment you're in. For the most part I sticked to the 45° 2-way disc shot, which is very powerful and has a good coverage when maxed out. Together with the formation attack, you can wipe out almost all enemies coming from the top of the screen before they reach the middle of the combat area, a condition that's very risky when the screen is filled with enemies. If you're out of the "F" formation icons, your weapon will simply flip backwards and vice-versa when you try to activate it, which is still useful, and again makes the 2-disc weapon the best choice of firepower. In the music department, at least 2 or 3 songs are noteworthy for their sci-fi overall feel. 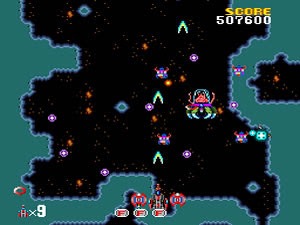 However, the weakest aspect of this little shmup is by far the boss battles. All bosses are wimpy. Even the last boss is a wuss, despite the unpredictable nature of his attacks. The most difficult part of the game is stage 6: it has no intermediate checkpoints, and you'll get to the beginning if you die facing the boss (try standing on the left side with the disc weapon, it helps). As with most PCE shooters, there are no options so you're stuck with the same difficulty forever, but the challenge is not as brutal as, for instance, a Raiden game. 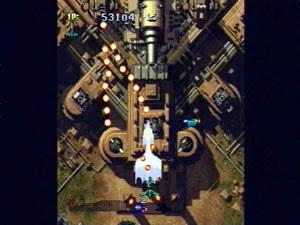 One extra life is granted after every stage, regardless of score or firepower. That makes Armed Formation F a good choice for an average shmup to beat during a weekend or a time span of 1 to 2 days. Once upon a time there was a kid who liked video games. First introduced to the wonders of the Atari 2600, soon he ventured into the worlds of NES, Sega Master System, Mega Drive and SNES. This evolution was broken because he had to attend college, so he did not experience the 32 bit era. He skipped it completely! Later in his life and having already established a reliable source of income, he got back to this wonderful world through Sony's Playstation 2. But something was still missing in his gaming routine. Something wasn't really right about fighting games and increasingly boring 3D platformers. Until the day he found out he was passionate about shoot'em ups! It was like a flash, as if a thunderbolt had hit him right on the head! A buying frenzy started and he set out to build his own shmup collection, while at the same time playing familiar and completely new games, games he didn't even dream of playing as a kid. He learned a lot since the outset of this new, exciting and challenging hobby. He learned from the experts. He learned from people who played better than him. And as he continued to learn, one day he decided he should have a special log just for 1CCed games (1CC = 1 credit clear). So now we come to the objective of this blog, my dear readers. This is where I'll keep track of my shmup achievements. For every new shmup I 1CC there shall be a post about it. I might add shmups I have already beaten if I happen to beat them again. I trust this is going to be a great ride, with lots of nice stuff for us shmuppers to talk about.